The Soft Serenade Rose Bouquet by FTD is a sunny and charming flower arrangement set to spread your warmest wishes. 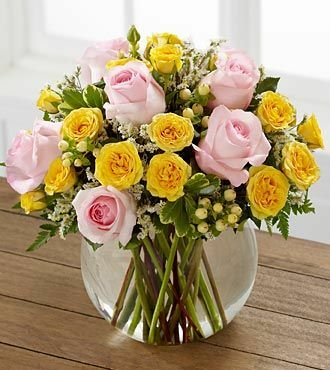 Pink roses, yellow spray roses, white hypericum berries, white limonium and lush greens are perfectly arranged within a clear glass bubble bowl vase to create a wonderful way to extend your wishes. No extra charge for same-day delivery. FREE personalized gift message included. (Extra delivery charge for Alaska and Hawaii) Same-day florist delivery is available for this item, for orders placed before Noon in the recipient's timezone. Please see the Ordering and Delivery Information.